One hundred and twenty days in the beautiful Negev Desert at Ben-Gurion University (BGU) was an intense, memorable experience. I was there as a Fulbright Senior Scholar to work with Professor Dan Mishmar, evolutionary geneticist. Located in the heart of the Negev in Beer Sheva, Israel, BGU is known for excellence in the biological sciences. 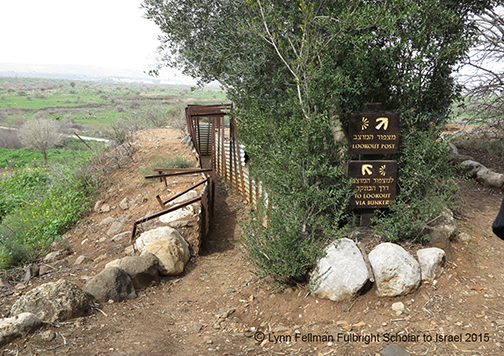 In fact, University President, Dr. Rivka Carmi, is a geneticist who led research uncovering the genetic basis of new born diseases in the Bedouin community. I was working at the University in Dan’s lab to make an animation about his research. Dan investigates the fundamental mechanisms of the mitochondrial genome. This is basic research at it’s most creative and about a topic I’ve been studying — mitochondria, genetics, and evolution. You can watch an animated explanation of the process to develop the work. I knew Dan from saying hello to him at scientific meetings. During the Society for Molecular Biology and Evolution meeting in Dublin we sat down and hatched a plan to make an animation based on his research. Looking for funding for a U.S. and Israeli project like ours, the Fulbright Foundation seemed to be a good match. After an arduous process my proposal was accepted, so I packed my multimedia studio and arrived in the desert during a fragrant rain storm. Week one and two were spent discussing the intent and focus of the project. I listened carefully to what Dan hoped to achieve. We considered the audience and why should they care? We decided to aim for the general public and to evoke curiosity about evolutionary genetics. From the many areas of his research, I elected to focus on the coevolution of mitochondrial and nuclear DNA. Do the two codes that make up our genome really talk to each other, I wondered? It seemed quirky and intriguing and if I thought so then other people might be curious, too. I showed my work to Dan in stages to check facts, get his reaction and ideas. Then I began turning sketches into illustrations, refining and timing the script, selecting the music, and recording narration. Assembling the elements in my animation app was the most intensive part of the process. Making a three minute animation is a lot of work. So why bother? Why should we care? It’s personal. Our gene story adds a new layer to our identity changing our sense of who we are. Soon all of us will have our DNA sequenced and we’ll want to know what it means to be active participants in our health and well-being. Gene savvy citizens can help direct more informed public policy to encourage support for basic research. That’s why showing the beauty and benefit of science and evoking a sense of wonder and curiosity to know more is important. After all, evolutionary genetics is fascinating. Especially the mitochondrial genome and the curious the curious conversation in our code. You can watch the original, uninterrupted version here. 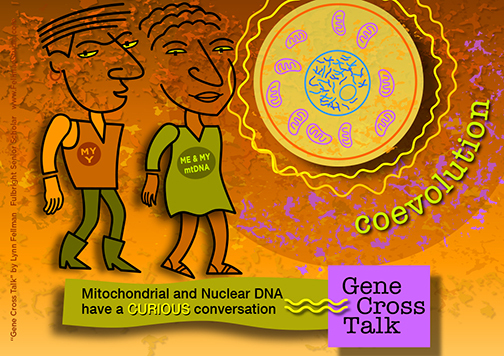 This is an image from “Cross Talk for Coevolution” an animation about the curious conversation between two kinds of DNA. The DNA in our nucleus (nDNA) gets most of the attention. But the other kind, mitochondrial DNA (mtDNA), is important too. Mitochondria is an organelle with a small, unique genome. The fascinating thing about DNA in mitochondria is that it exchanges information with nDNA so they can stay in synch. 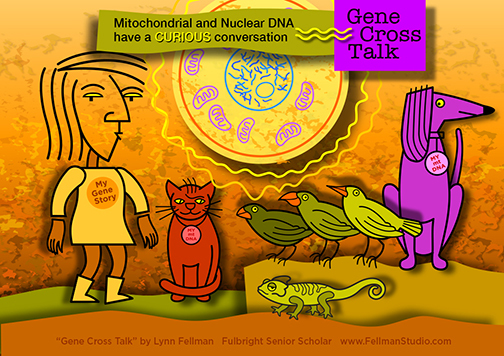 That’s the curious conversation for coevolution explained in “Gene Cross Talk”. The 3 minute, 22 second animation was funded by the Fulbright Foundation and Ben-Gurion University of the Negev (BGU). You can watch it here and listen to my explanation about making the animation here. It was produced during four months in Israel as a Fulbright Senior Scholar in Professor Dan Mishmar’s lab at BGU. The animation is my latest project from a decade long fascination with genetics, especially our ancient and personal genomes. My interest was sparked in 2005 by media stories about “Mitochondrial Eve” — explained as one woman from a biblical era. The science is much more fascinating than the myth. Not only does mtDNA provide many important functions for our cells, it is only passed from mother to daughter through many generations way back to a small ancestral population living in Africa about 200,000 years ago. As I learned more about my female specific code, I felt compelled to make a statement emphasizing science rather than biblical myth. I came up with a version of my female ancestor as an iconic, fertility-like figure similar to small excavated neolithic sculptures (below). Short, squat and round she is growing the double helix from a gene garden. 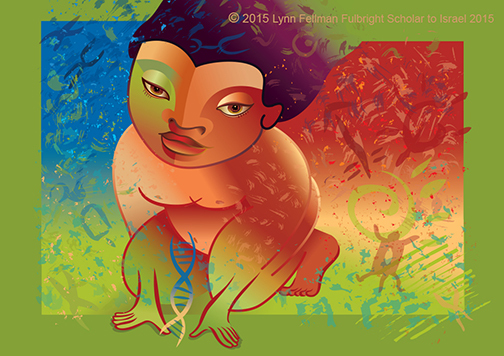 She shows possible admixture phenotype with asian eyes and african features. Contact me if you’d like to purchase a version of this image. Another beautiful day in Beer Sheva. Words I’ve repeated, like a litany, every day for the past one hundred and twenty while living in Israel. Waking up to blue skies and clear air that rivals what Cezanne, the father of modern art, found so inspiring in Arles, France, and made a recipe for my inspiration. I wonder if the 19th century master would find the colors and textures in this more southern Mediterranean landscape just as strange and exotic as I did? Yet, now that I’m packing to return to the States I wonder on what day in the past one hundred twenty, did scenes like this one morph from exotic to normal. 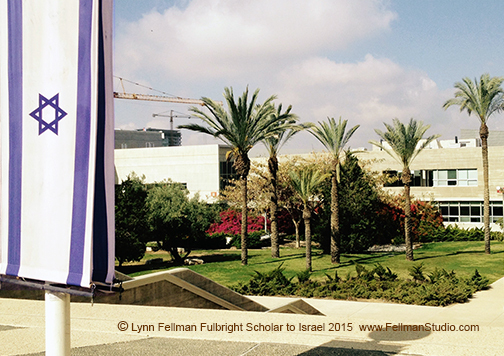 The photo is a bright spring day on the campus of Ben-Gurion University in the heart of the Negev desert. No wonder our extinct cousins, Neanderthals, made homes in prehistoric Israel 500,000 years ago. The view is not only stunning, it is strategic. The area is called the Levantine Corridor and it begins in Africa and then branches to the rest of the world along the edge of the Mediterranean. Our ancestors, anatomical modern humans, shared time and space with our extinct cousins putting down semi-permanent roots about 50,000 years ago. Writing an early chapter in the story of human evolution with bones, genes and tools — and perhaps refining a pattern of fighting to stay. The photo is a scene from Finger of the Galilee region in northern Israel, looking at the Hills of Lebanon in the distance and remnants of the bunkers from the 1967 Six Day War. To find your voice as an artist you must write. To develop original thinking, read what others have written. To refine your vision, collaborate with creative thinkers from science. To experience a transformation, you need to get out of the provinces. I experienced all of this since leaving the Midwest for the East Coast and especially during my four months in Israel as a Fulbright Scholar. Two aspects will have the strongest influence as time goes on. The first is validation and prestige which can ease the path to future funding to achieve my goal for broader outreach. The second, is a refinement of vision and reflection on the direction of future work from an-out-of-the provinces experience. 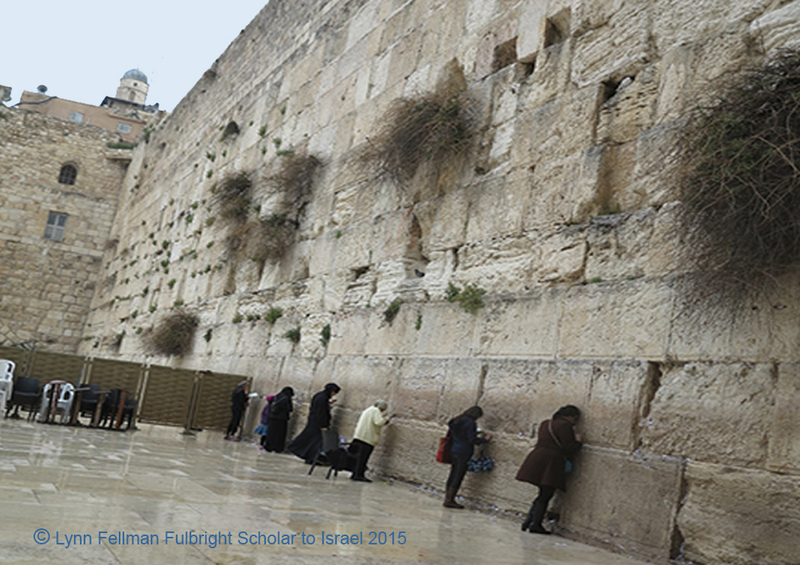 Shown above: the women’s side of the Wailing Wall, Jerusalem, one week before Pesach. Copyright 1999-2018 Fellman Studio Inc. All rights reserved. License information for Fellman’s work is described here.